Beauty, and What It Means: Do We Have to Make Body Love the Goal? When the National Organization of Women contacted me about today’s Love Your Body Day blog carnival, my first thought was to feel honored that an esteemed organization that has been a part of my life for literally as long as I can remember—my mother was one of the founders of a local NOW chapter in North Dakota when I was a wee one—had put me on their radar. Of course I’d be happy to participate (and I am). My second thought was: What? I continue to be surprised whenever someone refers to me as a body image blogger. I’m pleased by it, of course, and it’s certainly not inaccurate; I suppose whenever a feminist writes about beauty, the tyranny of the body beautiful organically comes under critique. And while I do have a body-positive spin in the sense that I don’t think any of us should suffer in the name of our bodies—and I made a conscious decision early on to never bash any bodies on here, including my own—less than 10% of my posts here deal with body image, or even bodies at all. More to the point of Love Your Body Day: I do not love my body, and I don’t particularly want to, and not once on this blog have I said any of us should. That’s not to say that we shouldn’t love our bodies, or at least sound an alarm when we find ourselves treating our body the way we’d treat something hated. But in my experience, the way to experience a relief from bodily scrutiny isn’t love, but not thinking about it so damn much. We’re at our best when we’re in a state of flow, wholly immersed in whatever we’re doing, whether that be our professional work, creative expression, or merely being fully present in the moment and sharing it with whomever is in our company. We’re at our best when we’re engaged—oftentimes engaged with others. Certainly many women treat their bodies shabbily because they’re focusing their energies on others and neglecting themselves; others, like me, start to treat our bodies shabbily when we become too focused on ourselves, allowing the roar of body dissatisfaction to dim out the world around us. And while conscious body love is a better response to that roar than continuing to punish my body in various ways, when I am focused on body love, my focus is both inward and separate from myself. When I file acts of self-care under that of love, it makes my body feel even more separate from my very self, instead of more unified. Bumper-sticker wisdom aside, love is not only an action word: It is a feeling. I don’t want to have feelings about my body any more than I want to have feelings about my intellect or my voice; I want it to be one part of the entirety of who I am, not something I have to have all these emotions about. To do that I need to care for my body—and I also need to consciously devote my love to things greater than my body, my self. If I keep my body into the category of Things That Should Be Loved, I’m continuing to sever my self—the self that can love—from my body. As with many people who have struggled with an eating disorder, the disconnect between the self and the body is part of what has allowed me to treat my body poorly at times. The times when I’m truly treating my body right are not times when I’ve decided to love my body for all it’s worth, but times when I’m authentically engaged in the world around me. If that bit of bumper-sticker wisdom is correct and “love is an action word,” that leaves me with little to work on. Care, on the other hand, is also an action word, and one that leaves me with a goal, not an elusive sense that I’ve either succeeded or failed in “love.” Care is a step we can take to make sure that, as Rosie Molinary writes, we are doing “the work we are meant to be doing and [giving] the gifts we are meant to be giving to this world.” At its beginning self-care may even be a way for us to even identify what that work is, something I struggled with for a long time. Care prepares us for our lives’—and our bodies’—greater journeys. My journey does not necessarily exclude loving my body. Neither is body love my goal. I don’t want to diminish the wonderful work of people who explicitly work to activate body love—women I consider my allies in trying to help all of us not be so damn obsessed with this stuff. Golda Poretsky’s Body Love Wellness, Medicinal Marzipan’s Body Lovin’ Projects—this is good work from smart women, and they’re but two examples of the plethora of body love work out there. Participating in these programs can bring a sense of flow in their own right, and I imagine the power of being wholly engaged with body love is mighty indeed. I know many people have been helped by programs specifically targeted toward body love, and that aid is vital and real—and in many ways, what body love experts are saying isn’t that different from what I’m saying here. As Golda says, “You can’t just arrive at [body] acceptance. If you’re coming from a place of not accepting your body, you first have to swing the pendulum the other way to love.” But the active path to body love isn’t the only path toward a similar end goal, even as it’s alluring when you’re in a place of tumult with your body. That place of tumult—of war—can be damning, silencing, and most frightening when you don’t even realize how much it can hold you back. I’ve been in that war at times. I know how hard it can be. I know. And looking at body love from afar seems more comfortable than the prickly, unbearable spot of shame that we inhabit when we wage war on our bodies. It is more comfortable. But body love is not the only way to find that space of comfort; love needn’t be the goal you’re working toward. For some of us, striving for body love as our personal pinnacle serves to reinforce the very self-consciousness that prevents us from doing our work in the world. Self-consciousness needn’t be negative in order to be damaging; caring for ourselves can be an act in its own right, not a pit stop on the path toward body love. For if the problem is that we wage war on our bodies, consider that the opposite of war is not love, but peace. Thank you! I have always been a bit uncomfortable with the idea of body love, and you've just perfectly articulated why. The best I could ever say was that I am aiming for body acceptance, and recognising the great jobs even the bits of myself I don't like do, and feeling comfortable with my body as being part of myself. But I don't *love* every part of my body, and I don't see why I should. Great post, Autumn. 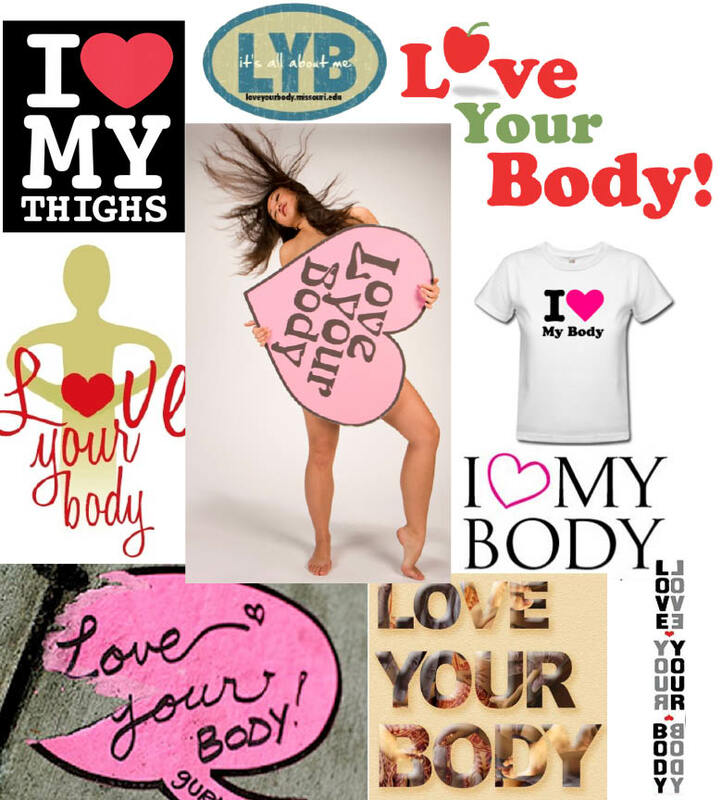 I think that when people become too entrenched in the concept of "body love" it creates a divide. So, anytime I am not engaging in an act of "love" (whatever that means to me personally) am I then waging war? See what I mean? I think there is potential for an all or nothing mentality that is very dangerous. It can easily become a meaningless catch phrase (like 'moderation'!) that can then be used to justify any and every act. "I am going to sleep with him because my body wants to and I love my body" - or - "I am going to sit here and polish off this pint of ice cream because my body is perfect the way it is and I deserve to eat." Both of which can be damaging activities. Great points, Autumn. This is a perspective that isn't often put forth, though I think many women feel uncomfortable with the pressures associated with "love your body" rhetoric. To each her own, no? Thank you for articulating this 'body love' thang so well! It's always struck me as a bit forced for my experiences. If someone is coming from a really negative place LOVE seems soo far away and frankly, kinda weird. It's hard to know what loving your body really is if you don't have good examples and if relationships where love (the feeling) is involved are often dramatic and negative as well. I try to aim for body friendship. It seems much more attainable (and maybe I/we have better examples of what good friends are?) and easier to learn to care for yourself in appropriate ways - I'm accepting of my friends, appreciate their "faults" and care about them. I love them but maybe in a different way - a love that feels like a lot less pressure than being in LURVE with your body! This post is great! I think if we starting looking at ourselves in a caring and kind way, we would all be better for it. I love how you said you don't love your body, because that's not what it's about. The important thing is to respect and take care of your body. This is such a good, thought-provoking post. I thought about this a lot, and it occurred to me that "body love" is one of those concepts that is meaningless without some kind of action to back it up. Like, to riff on the second-wavers, I'd say "body love is the theory, and self-respect is the practice." I'd rather people focus on respecting their bodies than loving them. Thank you for such a well-written commonsense commentary on body image. I'm sharing. "You can’t just arrive at [body] acceptance. If you’re coming from a place of not accepting your body, you first have to swing the pendulum the other way to love.' But the active path to body love isn’t the only path toward a similar end goal, even as it’s alluring when you’re in a place of tumult with your body." I agree with Golda, and I agree with you. Personally, nothing has helped my "body esteem" more than 1) not fretting so damn much, as you say and 2) reading blogs by women who are living bravely, happily, and aren't (visibly) fretting about every inch of their bodies. But as Golda said, sometimes the pendulum has to swing. My best friend recently mentioned how deeply she dislikes thick ankles--- and guess who has thick ankles? Bingo! I stuck up for myself, but still felt wounded for days. time to get back to Rosie's "Radical Self-Acceptance," eh? Autumn, this is so excellent and well-articulated. I agree completely. Taking a picture every day has given me a fine sense of "flow". Once that picture is in the can in the a.m., I am DONE wondering whether I look good today unless I accidentally wore something that turned out to be more fussy and uncomfortable than I thought it was. I am slowly ridding my wardrobe of all such things, though. But yeah, it's not body LOVE, it's body "whateverI'mfinelet'sgo". So I think it's useful to ask ourselves on this day, and perhaps someone could put this in one of the LYBD poster submissions, questions that encourage us to reflect on how we feel about our bodies, and why. "How do you feel about your body? Write a list: what about it do you like? Feel good about? Appreciate? List what, if anything, you dislike, not feel good about, not appreciate. Why? What, if anything, is keeping you from feeling the way you wish you to feel about your body? What messages have you gotten about your body that are consistent with the feelings you have on either list? What would help you feel more accepting or loving of your body just as it is?" I found it very helpful, on another of this Carnival's blogs, to be asked to list 7 physical traits I liked about my body. Not easy, but very helpful. I realized that I actually do like some things I usually am trying to change, or in some ways dislike, because of external pressures and judgments. Ultimately for Love Your Body Day to be effective in women accepting, respectful, and caring of our bodies, just as we are, it requires us to be honest about how we feel, to reflect on the origins of those feelings, and where useful, work to change society for the better to support girls and women so that more of us can feel good--rather than bad--about ourselves. Well-said! I think it'd be healthier to go out and do something you love instead of trying to gauge if you love your body enough. Just take care of it and enjoy your life. I've been sick for a long time. After I entered therapy to deal with accepting myself as a chronically ill person, I came to the realization that I'd totally separated my mind and body: My mind was "me," and my body was this thing I had to drag around. I hadn't realized how destructive that thought process was until I found myself crying when I apologized to my body for having been so _angry_ at it. As my health improves (and it has, considerably), my mind and body navigate the world together, and both parts seem more and more like "me"--no more duality. Thus I can't be fully comfortable with an objectifying "body love," at least not in myself; I just want to be one peaceful whole. From NOW’s website: “The goal of Love Your Body Day is to let companies and advertisers know that women refuse to accept ideas and body images that are insulting and unhealthy. It is a day to take action and take back the definition of what is considered beautiful.” I trust you have read this? I am confused by your post. Is this an issue of semantics? You claim you don’t write about “the body”, but with the greatest number of posts on your blog including issues of the gaze, cosmetics, beauty products, and body (tagged in 42 posts) I find it difficult to separate what you explore from the general idea that NOW is attempting to convey with LYBD. Franca and Cameo, thank you! Yes, the term can be empty, and I guess that's part of what I'm trying to get at here: What does "body love" even mean? I don't think the concept is a bad one, but I want us to all be more specific. Sal, exactly--I think every woman has her own way of growing into a place of bodily comfort, and for some "body love" might be it. But if that's the loudest voice out there against the sea of negative messages, people might believe it's the *only* other way, which it isn't. ModernSauce, Courtney, LifeBliss Lisa, Alexa, Halley, LW--thank you! "Body friendship"--love it. I also like the idea of body as family love--I love my family, of course, but I don't have to think about it. I just trust that they're there for me, and me for them, and while I don't take them for granted it's not this thing I'm striving for. That's a "body love" I'd be happy with. Caitlin, your take on this is very much in sync with mine--respect is something active we can do. Love? Who knows what that means?! Rebekah, I'm glad you don't see our takes as being incompatible, because I don't think they are either. I think everyone's efforts are going to help, and that ultimately Golda and I are on the same page even if we use different words to get there. At times each person is going to be helped by different rhetoric too, something that I forget when I take polemical stances on these topics. Cynthia, a joy to meet you and your blog! I like your thoughts on the daily self-portrait--like, you've taken a definite action and now you can move on to other things that ultimately interest you more. Brava! Alice, I like what you're saying about concrete steps. If you're not already familiar with Rosie Molinary's "Beautiful You" book, I encourage you to read it--full of activities that help holistically (and not only in a woo-woo deep-breathing way--that too, but also about community work, and family appreciation) to get us all to a place of acceptance and peace. Molly, I'm glad that you're finding yourself better able to take a holistic approach as your mind and body heal together. You more than most probably understand that it's a whole package, and that even treating them as friends creates a dualism that might not be helpful.